Las Vegas-based Boyd Gaming recently announced they would be issuing bonds valued at approximately $500 million. Boyd Gaming (NYSE: BYD) operates several casinos and will be the operator of the Wilton Rancheria's proposed casino resort. According to a press release issued on June 19, BYD is offering the notes with an eight-percent interest rate in a private placement. Additionally, the press release noted, "The senior notes will be fully and unconditionally guaranteed by certain of the Company's current and future domestic restricted subsidiaries." BYD said that the proceeds from the sale are expected to net approximately $492 million. Among the uses, the money will be used for future expansion, refinancing debt, and general corporate purposes. Since the project was introduced at a town hall meeting held by former Mayor Gary Davis and the Wilton Rancheria two years ago this month, the cost of the project had been pegged at $400 million. In recent months the cost of $500 million for the project has been circulated. Following last year's state gaming compact that was signed into law by Gov. Jerry Brown, casino proponents have expressed qualified confidence groundbreaking on the facility would be starting this summer. Even though 36-acres have been secured for the facility on the grounds of the unfinished Outlet Collection [shopping center] at Elk Grove, demolition of the existing shell buildings on the site has not commenced. 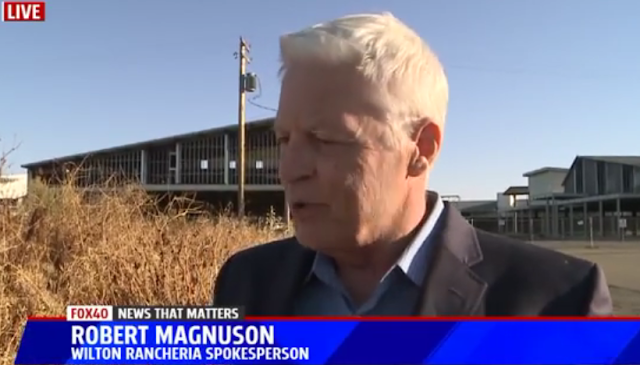 In an interview on Sacramento's Fox 40 news, Wilton Rancheria public relations representative Robert Magnuson said the casino construction, under a best-case scenarios, could have started this summer. An abbreviated version of the interview is posted below, and the extended interview can be viewed here (Facebook registration required). Magnuson did not respond month to an email request sent last month seeking comment on the BYD financing action and if it was a funding source for the Elk Grove casino. Even though the Wilton Rancheria has expressed confidence on an expedited construction schedule, significant legal hurdles remain. Casino watchdog group Stand Up For California has been battling the approval process that placed the 36-acres purchase on behalf of the Wilton Rancheria at the unfinished Outlet Collection at Elk Grove. Using the Federal Vacancy Reform Act of 1998, SUFC has challenged the placement of the land into federal trust for the Wilton Rancheria in federal district court in Washington D.C. While Judge Trevor McFadden has ruled against SUFC, he has granted them access to the so-called privilege log. While the casino project continues to languish, it is noteworthy that construction of the unfinished Outlet Collection at Elk Grove, dubbed the Ghost Mall, came to an abrupt halt 10 years ago this month. It's funny how when there's good news, everyone's giving interviews and sending press releases to the TV stations. Bad news, it's run silent, run deep!If Bugsy were around, he'd get er' done! Can you say General Growth Properties?